Can the Transformer turn minimum specs into something surprising? The latest Transformer suffers in comparison with the Flip and Chi, and even when compared to similarly priced Chromebooks. Its bright, colourful screen is one of this device's few saving graces. Few laptops get to be brands. But Asus' Transformer is a brand in itself, having been around since 2011, when it was a ground-breaking design. The concept of all the computer's brains being carried in the screen was truly innovative, and the removable keyboard was a neat trick too. The world has changed since 2011, and now tablet-laptops are ten a penny. Even Asus does three different versions of the Transformer, of which this is by far the cheapest – the Chi is an ultrathin version and the Flip is a rotating variant. The biggest competitor of course are Microsoft's Surface Pro PCs, which follow the Transformer's model exactly, but with a much higher level of quality. Similarly, put a keyboard stand on the latest iPad and you have another competitor – though this device is actually closer to the Kindle Fire in terms of size and performance. That reflects the fact that the T100 models are the smallest of the Transformer line-up at a diminutive 10-inches wide. They've also moved on and are no longer the flagship product they once were – as can be seen by the low resolution screen, poor SSD substitute and slow processor. But perhaps all this could come together to be more than the sum of its parts? The tablet is fine to look at, with a wide glossy black bezel around the small screen, and its exterior is pleasantly cool to the touch. We were supplied with the least interesting colour available, the bolt gun-metal version, and we can safely say that we'd never pick anything this dull. If you're going to buy this machine, make sure you get one in a more effervescent colour such as off-white, pastel blue or electric pink. The keyboard matches the tablet design, with a smoothly curved lip that makes it seem thinner than it actually is. However, despite being nearly the same weight as the tablet itself, it's construction is much flimsier – and I didn't find it great for typing on, with the construction too narrow and bouncy for my mighty meat-paws. I also had repeated problems with the touchpad's clicking and buttons, in which I had to hit the same spot multiple times before it would register. As we always say though, you need to try a laptop keyboard yourself before buying – it's one of those areas where everyone's experience is different. The two distinct elements are joined by three separate ports that clip together quickly and easily, without much force or manoeuvring. When in place, it's a solid connection which seems like it could take some punishment without breaking apart – the hinge is cunningly built into the keyboard itself, so the ports aren't taking the strain. Despite that, the tablet itself is heavier than the keyboard, so has a tendency to fall over – making it awful when typing on your lap, for example. The tablet is obviously no iPad Air, presenting a chunkier profile from both front and side-on. 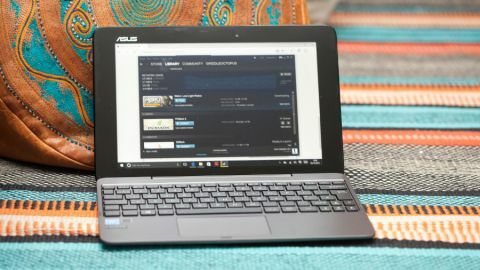 Asus marketing claims that the "T100HA (is) super-slim but strong enough to shrug off hard knocks and scrapes that come with a hectic on-the-go lifestyle". It does look like it could take a whack or two – but we weren't tempted to try that proposition out. We noted the aluminium lid looked pretty scratch-proof, but after a ride in a bag around London for the day, it had a couple of marks that we couldn't polish or buff out. Despite that, the underlying frame seems extremely rugged.